My father was born on the 7th of February 1939 and died in the early morning of Friday 20th of March 2009. It was sudden and completely unexpected. My mother and father had spent the previous evening with my sister and Dad felt healthy at that time. None of us expected this to happen at all. A holiday was planned for Monday, and we were looking forward to my parents visiting us again later this year. The first photo shows my father cycling here in Assen in October last year. He wasn't a very enthusiastic cyclist these days, but we went for short rides together when my parents visited. He told me tales years ago of riding with a full milk churns balanced on the top bar his bike, and making a trailer to carry more of them. This photo is of my mother and father with me in their garden in Burnham-on-Sea in July 2006, just before I got on a train to head for Land's End. I was back with them by bike a couple of days later by bike, passing through again on the ride. This photo was taken at the Bath and West show in Somerset. My father was selling baskets and my niece, Gemma, was helping out. 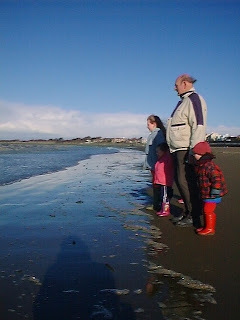 Looking out to sea from Burnham sea front, with Gemma and our eldest daughter, Eliza. I miss my father. He was really a great person. Kind, helpful and hard working. Somehow he seemed to know how to do almost any job. I can remember him doing everything from repairing the TV, plumbing, welding, woodwork. He was the best basket-maker I've met too. He taught me many things. Including how to ride a bike (I remember being terrified that he'd let go, then he did and I was fine), how to repair a bike, how to make baskets. There are some more photos of my father and his work here. You have my deepest sympathy, we lost my mother-in-law, on the same day. Life just feels so much emptier now. Gecondoleerd met dit grote verlies David! Probably not the Dutch words you wanted to learn, but meant well. What a beautiful piece you wrote to remember your father! A bit lost for words now, but thank you for sharing it. I'm sorry to hear that. I wish your family strength to carry on without him. Sorry to hear about your father. My deepest sympathies, and my best wishes. Many condolences and best wishes. I'm sorry to hear about that. Your father sounds like quite an inspiration. Deepest condolences. So sorry to hear of the death of your father. My father died 19 months ago. I still miss him every day. My father and I would talk with each other all the time. I still catch myself seeing things and saying to myself "I'll have to mention this to Dad." And then realizing that this will no longer happen. May our fathers rest in peace, to rise in glory on the Day of Judgment. Very sorry to hear your sad news. My sincere condolences to you and your family. I am very Sorry to Hear the News of your Father Passing away, my Extreme Condolences. He was a Great all Rounder,A Jack of all Trades.You will miss him Greatly. I'm sorry to hear of your loss. My condolences to you and your family. Loss of a loved one is never easy. Take comfort in the fact that you had him in your life for so long, and that he knew you as the good man he brought you up to be. I lost my father while I was just entering high school. Since then, I've grown up and have become a very different person with a family of my own. I wish he were here now to see the life I've made for myself. At any rate, you are in our thoughts, and have my deepest sympathy. So sorry for your loss. 70 is not very old at all. My dad's older brother died last week, and I have been thinking about my father and how much he means to me and how he has influenced me as a person. My father and I are very different, but it's amazing how memories and stories have been flooding my thoughts - events in his life that shaped him in turn became themes in my growing up with him. It's so oddly clear how I can see his morality and integrity now, how other people seem impressed when I do something simple seeming to me like help someone else in some small way. And it's no big deal, of course I would help. But now I think it's much more of a tribute to my dad, he has always helped people. Wonderful that I must have learned it from him. We are fortunate for our good fathers. He sounds like a great guy, and much missed. I am sorry for your loss. My condolences to you and your family. please accept my condolences, especially given the unexpected nature of your father's death. I'm still going through firsts since my Mum died last year; this weekend past it was "first Mother's day without Mum". I'm so sorry, David. He sounds like a wonderful father who shared his many talents with you. I'm sure you will be grateful for his influence for the rest of your life. Heel veel sterkte, voor jou en je familie. Peace be with you and your gentle spirit. May your remembrances of your father bring you comfort and future recollections of him bring you joy. i lost me old mum a couple of years back. know the feeling all too well. He lives on in you and yours. He is in your children and your baskets, so you will not have to go far to 'see' him. I wish you strength and courage in the days to come, and love and memories in the life you have yet to live. He sounds like a great guy - my condolences and sympathies. I enjoy reading your blog. You seem like a very decent and dedicated person and so I'm saddened when someone such as yourself loses someone close. Your father also sounds like he was a very decent and dedicated person. I trust that his good deeds and good character will live on through you and your children. My condolences to you and your family in this difficult time. Sorry to hear your news. Condolences. I'm very sorry to hear about your loss. My sympathies to you and your family. I'm sorry to hear that, David, my condolences to you and your family. He will live on in your memories. My deepest sympathy to you and your family.